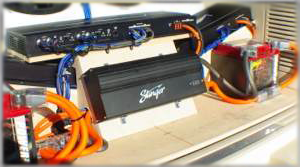 Stinger Capacitors help your car's electrical system run smoother. If your lights are dimming, or your system is cutting out a capacitor may be the answer. A capacitor picks up the slack of your car's battery. For example say your system hits a really low bass note, your amplifier will try and pull more power from your battery. Since your battery can only discharge at a certain rate, the amplifier does not get all the power it needs. This is where a capacitor will discharge the needed power almost instantly, and the system will continue running smoothly.